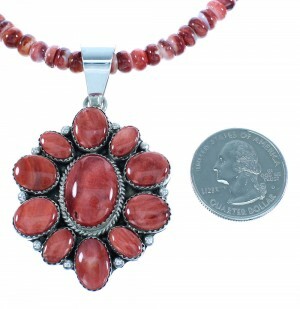 Pendant measures approximately 2-1/2" long (including bail) and 1-1/2" at widest point. Necklace measures approximately 18" long. This necklace set is a Navajo classic! 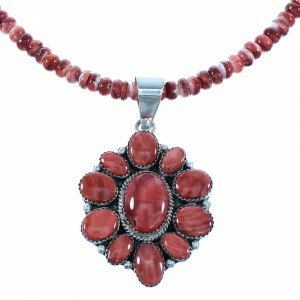 In this Native American jewelry set, the pendant is Navajo hand crafted by artist B. Benally, out of genuine sterling silver and real Red Oyster Shells. A total of ELEVEN stones are gently set in hand cut bezel settings, while being accented by twisted silver and Mini silver beads for a dazzling look. The pendant is stamped sterling and hallmarked. 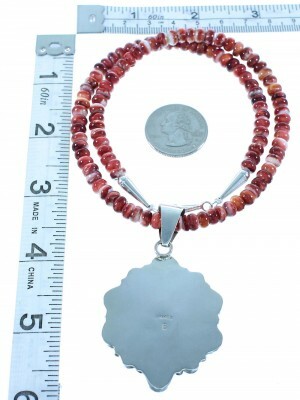 The necklace is hand strung out of genuine sterling silver and real Red Oyster Shell beads. 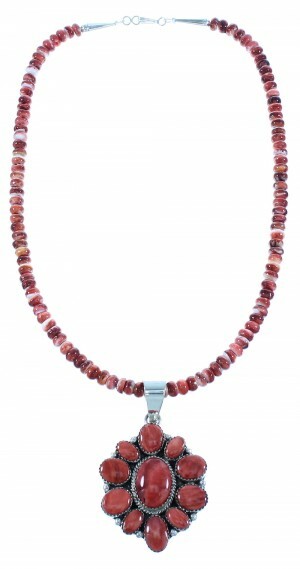 The necklace consists of 6-mm Red Oyster Shell rondelle beads. 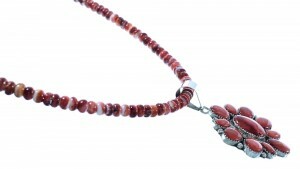 Each end of the necklace is completed with a silver cone and bead for an exquisite finish. The cones are stamped sterling.